This lovely lady was standing a few feet from me on a rural train platform in Japan. I loved the jade coloring of her kimono accented by her pink and red obi. 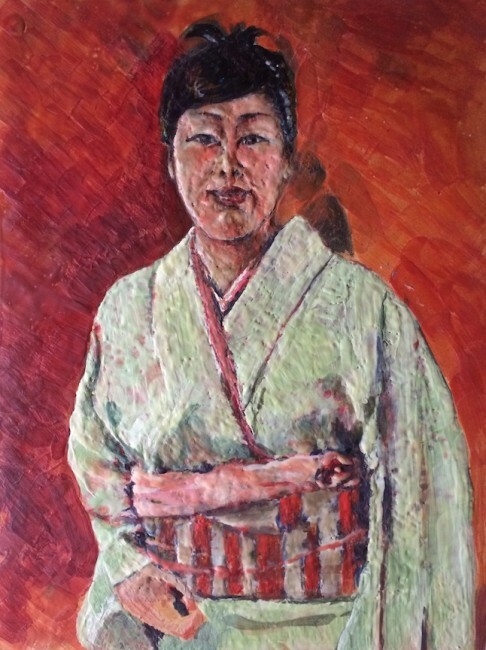 I used a cinnabar colored background to allude to the Asian influence, which worked well juxtaposed against the light greenish hues of the kimono. Jade Kimono was created using encaustic pigments painted over a print, created with xylan and a photograph, on a veneer panel.